The Digital Arts and New Media graduate program at UC Santa Cruz is always turning out remarkable artists who are creating noteworthy projects. Case in point — artist Eve Warnock who will graduate from the esteemed program in June. As a multi-media and interdisciplinary artist, she is a director, designer, performer and storyteller. 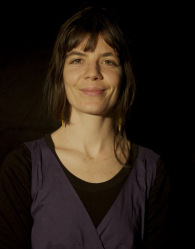 Her media of choice include experimental films and installation projects. As the 34-year-old prepares to graduate, she will teach a course this summer hosted by the Museum of Art & History at UC Santa Cruz titled “Procession.” The final project will consist of “processing through downtown Santa Cruz and ending with an open critique and question and answer,” says Warnock. Learn more about this multi-talented artist at evewarnock.wordpress.com.